This sweet card is in two pieces - a pocket, which resembles a little flower pot, and a tag that slides in and holds most of the embellishments. Great for birthdays, Mother's Day, or even Christmas, you can "fill" the pot with just about anything you like. It doesn't have to be flowers... perhaps candy canes, paint brushes or buttons instead. 1. To form the pot, start with a piece of card stock measuring 11" long x 4" wide. 2. Score and fold at 2" and 61/2". 3. Use a decorative border punch along the short edge of the 2" section of card stock. Try to line the card stock up with the centre of the punch for a neater look. 4. Fold the bottom piece up but open the 2" section. Along the fold line, use a ruler and pencil to measure and mark 1/2" from either side. Draw a line from each mark to the 2" score line (refer to the picture below). 5. Use a trimmer or craft knife to cut along the lines. Remember that the card stock is folded in half so you are actually cutting through two pieces. 6. Fold down the 2" section of the card stock and then flip it over. Add small pieces of double sided tape to the inside of the pot and bring the two sections together. The adhesive will hold the sides closed creating a little "pocket". 7. Cut a piece of patterned paper no smaller than 41/4" wide x 43/4" long. This will decorate the front of your "pot". 8. Apply double sided tape to the pot, under the decorative edge, and fix the patterned paper over the top. You only need to add the paper up to the score line. 9. Flip the "pot" over. Use scissors or a craft knife to remove the excess patterned paper by following the edges of the card stock. 10. Turn the "pot" over again and lift the decorative edge as shown in the photo below. Apply a couple of small pieces of double sided tape and press the fold down. This will hold the "lip" of the "pot" in place. 11. To make the tag, you'll need one piece of card stock measuring 6" long x 3" wide and a second, smaller piece measuring 53/4" long x 23/4" wide. 12. Use double sided tape or glue to layer them together. If desired, stamp a sentiment on the tag toward the middle or bottom so that it doesn't show when the tag is placed inside the "pot". 13. Time to add the embellishments. I found it easiest to add the leaves and flowers while the tag was inside the "pot". Since my card is actually Christmas themed, I have added some large poinsettias that I cut from patterned paper. As mentioned earlier, you can add whatever embellishments best fit the theme of your card. 14. When you secure the flowers to your tag, make sure the petals can slide over the top of the "pot" by keeping the adhesive in the centre of the flower rather than the edges or tips of the petals. You can also add a flower to the "pot" for a fuller look. Photographs and written instructions are copyright Beccy Muir. Thank you! I will be doing this!! Yours is great! Wonderful Beccy! Thank you so much! This looks like a fun fold to try when I have the time. 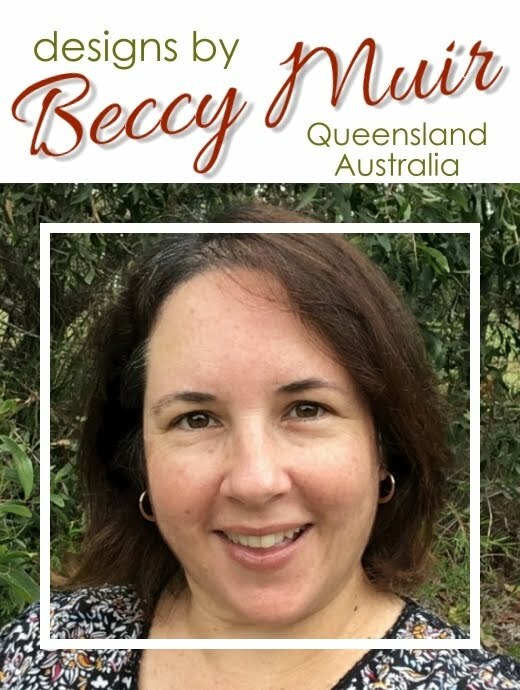 Thanks for the lovely inspiration Beccy. I absolutely love this! Can’t wait to make some for Christmas. Thanks so much for the wonderful ideas! !